Even before it had issued Is This It in 2001, The Strokes — with its fusion of New Wave, punk, British-bred R&B, and the good, old-fashioned, New York City grit — was being hailed as a legend in the making, one which would save rock ‘n‘ roll from becoming an increasingly manufactured commodity. The pressure upon the ensemble undoubtedly was enormous, and not surprisingly, it took its toll upon the band. Consequently, rather than making a bold statement with its follow-up Room on Fire, it merely sculpted a conservatively formulaic remake of its debut. Even so, its influence resonated with the force of a high-magnitude earthquake. Not only were there countless other outfits attempting to hitch a ride upon the collective’s coattail, but veteran act U2 took full advantage of The Strokes’ successful, no-frills style in order to return to its roots on How to Dismantle an Atomic Bomb. While this is about as flattering a position in which an up-and-coming group could possibly hope to find itself, it’s also one that poses its own set of challenges. 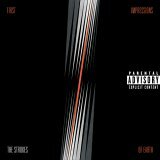 In essence, The Strokes needed to alter its approach or risk fading into the backdrop as a one-trick pony. The good news is that, although the changes that mark its latest endeavor First Impressions of Earth manage, strangely enough, to straddle the line between being subtle and glaring, The Strokes essentially found fresh methods of deploying its signature sound while also continuing to embrace its decidedly indifferent attitude. In fact, several tracks, such as the remarkably engaging Razorblade, rank among the very best that the band has ever recorded. Nevertheless, the set isn’t without its share of difficulties. Interestingly, The Strokes seemingly answered U2’s call, and it subsequently turned First Impressions of Earth into a much darker tome. Shedding, at least in part, the Stones-ian, skirt-chasing antics that filled much of Is This It, front man Julian Casablancas now has turned his attention to pondering his own mortality as well as the scourge of Western civilization. Yet, his attempt at concocting weightier lyrics — which, incidentally, are delivered in far less of a garbled fashion than those on the group’s previous endeavors ever were — are no match for Bono’s cleverly layered ruminations. In short, Casablancas’ musings are clumsily crafted, and when combined with the bits of stoner wisdom that are sprinkled throughout the album’s liner notes, they can’t help but to feel as if they were culled from a pile of Morrissey’s leftovers. Then, there’s the problem that The Strokes sounds, at times, less like a trendsetting band than it once did, and although its style has never been unique, much of First Impressions of Earth finds it regurgitating the past in exactly the same fashion as every other mainstream rock outfit on the planet. Shades of early U2 filter through much of the endeavor, and although this is particularly apparent on both the crunchy single Juicebox as well as the ringing guitars of Fear of Sleep, even the manner in which Casablancas strikes a soaring soul-pop stride appears to be drawn directly from Bono’s book of artful articulations. Elsewhere, he cops from Radiohead's Thom Yorke to deliver Electricityscape, while Ask Me Anything is underscored simply with the heady, Beatle-esque swirl of Mellotron. None of this, alone, is enough to wreck the affair, and at times, The Strokes succeeds quite brilliantly in pulling off its newfound inclination for experimentation. However, given that First Impressions of Earth contains more than 52 minutes of material, there unquestionably is just too much waste contained on the outing, especially considering that The Strokes was once a band that thrived on being unerringly concise.